Maliseet educator, researcher and leader, David Perley, has recently been selected as the new director of the University of New Brunswick’s Mi’kmaq-Maliseet Institute (MMI). Perley, who specializes in Aboriginal education, Aboriginal studies, race relations and analysis of social problems, holds a B.A. from St. Thomas University, a M.A. from UNB, and is currently a PhD student in education at UNB. Ann Sherman, dean of education at UNB, says the history, experience and education Perley brings to this position is invaluable. 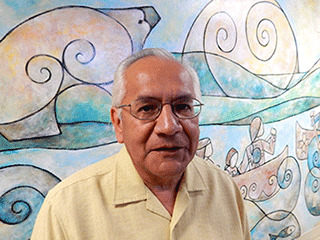 Perley is a former Chief of the Maliseet Nation at Tobique (1983-1989) and has been employed as consultant for federal and provincial departments such as Education, Justice, Solicitor General, Child and Family Services as well as Indian and Northern Affairs. He’s retired from the N.B. Department of Education (Mar., 1990 - Oct., 2003) and while with the education department, he held the position Consultant: Aboriginal Education. His duties and responsibilities included policy/program development and implementation of initiatives designed to meet the educational needs of Maliseet and Mi’kmaq students attending public schools. Perley says this new position appealed to him because of his lifelong interest in Maliseet/Mi’kmaq education and researching initiatives that are designed to improve education outcomes for First Nation students. “The position provides an opportunity for me to continue pursuing my personal goal in helping our Maliseet and Mi’kmaq students succeed at the university level and to assist UNB faculty and students to understand and appreciate our Maliseet and Mi’kmaq histories, cultures, languages, philosophies, knowledge systems, traditions, ceremonies and world views,” said Perley. The initiatives Perley has in mind would not only benefit First Nations students on campus, but would provide culture-based education to everyone on campus as well as UNB’s visitors. The Mi’kmaq-Maliseet Institute (MMI) is one of the only centre for First Nations education studies in the Atlantic region. The Institute administers programs for First Nations students at UNB and helps First Nations students enter the undergraduate faculty of their choice. MMI also serves the First Nations in the Maritime Provinces and the Gaspé, working closely with these communities to expand the professional horizons of young adults and mature students. Perley began his new role this month and will replace Lynda Doige, who recently retired after serving as director since 2006.